India's election: What's at stake? As Indians begin heading to the polls in the largest election in history, GPS intern Aakanksha Tangri explains what’s at stake, who the key players are, and what the election means for ties with the United States. It will be the world’s biggest exercise in democracy. 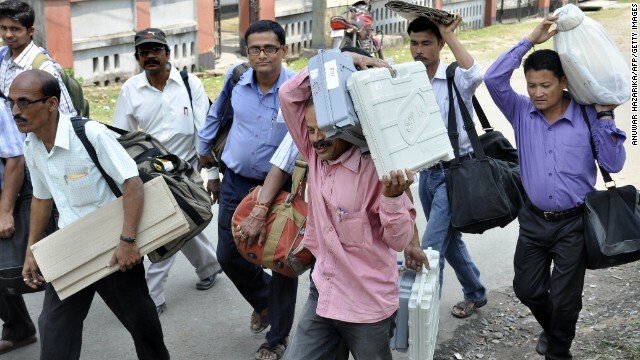 As India heads to the polls from Monday, some 814 million people will be eligible to vote in a general election that will be broken down into nine phases at over 900,000 polling stations across the country. Indeed, the final votes won’t be cast until May 12, before they are all counted on May 16. The election pits the ruling Indian National Congress’s Rahul Gandhi against Narendra Modi, the candidate of the main opposition Hindu nationalist Bharatiya Janata Party. But despite the storied history of his family name, Gandhi is widely seen as the underdog against the current chief minister of Gujarat. The United Progressive Alliance (UPA) coalition government, led by the Indian National Congress, swept to power in 2004 under the leadership of Sonia Gandhi, who surprised many by declining to take up the post of prime minister, instead calling on respected former Finance Minister Manmohan Singh to take the helm of government. But despite putting together a comfortable majority in a second consecutive election victory in 2009, a stalling economy, numerous corruption scandals and a perceived lack of direction left many Indians craving a change this time around. “The UPA 2 has been the worst government India has seen since liberalization, without question,” says Sadanand Dhume, resident fellow at the American Enterprise Institute in Washington. “They dropped the ball in terms of economic policy, where India is experiencing its most sustained slowdown since the advent of liberalization in 1991. They’ve dropped the ball on foreign policy – you’ve seen India’s stature in the world diminish. They have dropped the ball in terms of domestic policy too – there’s strife in many parts of the country and communal relations are not particularly amicable right now,” Dhume says. Disillusioned with a coalition that appears to many to have lost its way, Modi looks poised to capitalize. Yet despite being widely hailed as the driving force behind Gujarat’s booming economy, Modi remains a controversial figure over his alleged role in anti-Muslim riots in the state in 2002, in which nearly 2,000 mostly Muslims were killed. And while a Special Investigation Team appointed by the Supreme Court exonerated him in 2012, critics – including The Economist, which last week advised against voting for Modi – fear the chief minister would be divisive in office. And they also question whether he will be able to adopt his micromanaging to the virtually inevitable reality of coalition politics. “Since 1989, no single party has been in a position to form a national government in Delhi without the support of key regional parties,” notes Milan Vaishnav, an associate at the Carnegie Endowment for International Peace. Modi rose through the ranks of the Rashtriya Swayamsevak Sangh (RSS), the BJP’s parent organization, and one of the key factors that sets this election apart is “the cult of personality built around the candidature of Narendra Modi and the manner in which his party's subordinate to him,” notes Siddharth Varadarajan, journalist and senior fellow at the Center for Public Affairs and Critical Theory in New Delhi. Meanwhile, Modi’s humble beginnings (he was once a tea seller) and subsequent rise in Indian politics have been at the heart of the narrative of the BJP’s campaign against the Congress and Rahul Gandhi in particular, whom Modi has referred to as shahzada – the princeling. Gandhi, 43, has a towering legacy to live up to. His great-grandfather, grandmother and father were prime ministers of India. And yet despite the seeming inevitability of his rise, Gandhi has seemed reluctant to step up to the plate. The Congress, meanwhile, has also seen its fortunes sag on the campaign trail. “The BJP has run a very modern, very professional and very ruthless campaign, with a bold and well thought-out strategy,” says Nitin Pai, director of the Takshashila Institution, a public policy think tank in India. “The Congress has been late in the game, suffers from poor leadership and is punching below its weight. The BJP has narrative dominance and is setting the agenda,” Pai says. If the Congress’s perceived failure to take the initiative extends to the realm of social media, then the party really could find itself in trouble. This year’s poll marks the first time that large numbers of politicians are utilizing social media to engage with young and urban voters – a potentially key factor considering that more than 23 million potential voters are aged 18 or 19, and voting for the first time. “It is not hard to imagine that as far as the upcoming elections go, a platform like [Twitter] for live, public conversations, will play a central role in a democracy where every Indian citizen wants to have an equal say,” says Raheel Khursheed, Head of News, Politics and Government at Twitter India. But Indians won’t be the only ones watching how events unfold over the next six weeks – the United States also has a keen interest in who India chooses as its next prime minister. After all, Indo-U.S. relations hit a low recently with the uproar in India over the treatment of Indian diplomat Devyani Khobragade, who was arrested and subjected to a strip search in December after allegations she lied on a visa application how much she paid her housekeeper. “These elections could be chance to reset a relationship that has been a bit troubled of late,” says Ravi Agrawal, CNN’S India bureau chief, noting Obama had described the India-U.S. relationship as the defining partnership of the 21st century after winning the presidency in 2008. “These elections give both sides a chance for a reset,” he adds. And fresh thinking will be required not just on the international front, but at home, too. The “India shining” narrative has in many ways been replaced in recent years by one of a floundering economy led by a government that many charge has lost its way. The question now is whether Indians will take a chance on a relatively inexperienced leader heading a secular party, or will they be tempted by a dynamic regional politician who promises to repeat the strong economic growth of his state. You clearly haven't been to India. You don't know what's a steak? Well Holy cow, no kidding! Hunh? What do you mean? There's lots of steak in India – sold out in public in many places from $ to $$$$$ restaurants! Clearly YOU have never been to India. Christians, Muslims, Parsis, Indians of Chinese origin and many Hindus of all castes enjoy steak – and yes, that is BEEF steak! And you obviously don't know that Virgins don't give birth to child. Only doing it in the dark leads to illegitimate child who ppl call God. As controversial as Narendra Modi may be, once elected, he will have to reinvent himself and be ready to strike deals and cooperate with other parties and perhaps build coalition. He had been successful in Gujarat, which has a population of some 60 millions, who, to 80% are Hindus. Yet ruling India is quite a different challenge. This will be a daunting task and it's not certain, whether his success would repeat itself, should he stick to the same old recipe. The controversy part is only created for political reasons. From your name, I am assuming you don't know since 2002, there hasn't been a single riot of any scale in that state, and in that state only.. No curfew(police crack down) ever since, the only state India can boast of in last decade. You can bet he can learn first. And that shows in his interviews. Very clear and simple beliefs of respect me and I will respect you. Amazing energy – has done 300+ rallies (public meeting) so far. I am 20 years younger than him, but I doubt I can even attend so many meetings in so many days. No doubt, all liberals are supporting him.